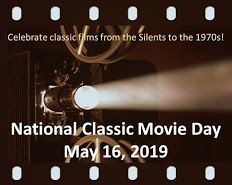 The Classic Movie History Project Blogathon Launches in a Few Days! We’re so excited for this blogathon we can hardly contain ourselves! The post below is from the fabulous Fritzi at Movies, Silently, who is the brains behind this outfit. I’m excited. Boy, am I excited! Just a few days remain until the Classic Movie History Project Blogathon gets underway. My co-hosts are Ruth of Silver Screenings and Aurora of Once Upon a Screen and our sponsor is the wonderful Flicker Alley, which is supporting the event in honor of its release of 3-D Rarities (did you know it is the centenary of 3D film?) and Dziga Vertov: The Man with the Movie Camera and Other Newly-Restored Works. There is also a giveaway for the 3D release (you don’t need a special TV or anything to enjoy it) so be sure to check that out as well. Please inform the hostess you “belong” to that you have posted and provide the URL. Please link to the event page for the era you are covering. I’m the silent era, Aurora is the Golden Age and Ruth is modern. Flicker Alley is helping spread the word about the event and is basically acting as a forth host so please link to them as well, if possible. If there are any issues with the links or any other concerns, please contact one of us. Feel free to contact Ruth, Aurora or myself if you have any questions. We don’t bite. Well, not often. Looks like it’s time to watch a LOT of Adam West’s Batman. Man, I am such a procrastinator. At least I picked something fun to watch, so, there’s that. Since my topic is big, I’ve already published Part 1. Probably releasing Part 2 tomorrow and then Part 3 over the weekend. Look at all the fabulous reading waiting for us. My eyes are getting sore! Okay, I have a couple of questions if it’s not too much trouble. 1. Am I supposed to post on the 28th, since I’m part of the Modern Era era? 2. Is this page the event page, or is it something else? Hey there! It would be best if you could post before the 28th, then I will link to your post when I upload the Modern Era Sunday morning. If you could copy the link in these comments, that would be great. However, if you can’t post before Sunday, that is A-OK. Just send me the link when you’re ready & I’ll add it in. Still not quite sure about it, but, then again, when it comes to criticism, I am my own worst enemy. Excellent! I’m looking forward to this. FYI – I’ll be uploading the “MODERN ERA” post early Sunday morning. Phew! This was a big project! Thanks. I think I have it figured out now. I “belong” to Aurora. Let me know if I should message her or if you got it. Yup, we got this. Aurora will be posting in a few minutes & says she has all three parts. What – you’ve been distracted by, oh, writing an epic 3-part post on the downfall of the Hollywood Studio System? Thanks for joining us! 🙂 I love this movie & will be by soon to check out your review. Happy 4th to you! So glad you joined us for the blogathon – we were hoping you would. 🙂 I am away visiting relatives with limited internet access, but will try to add your post to the list today or tomorrow. Thanks!